I think, somehow, that this might prove to be an oft visited post. While the government's aims are for high quality SENCos to interpret the new SEND Code of Practice and skillfully provide the right SEN help to each child who needs it using the Assess, Plan, Do, Review circle of support, I fear that the reality maybe some way behind the vision. It's not that they won't get there in the end, just that those families on the sharp end of the reforms - ie, us - might not end up with what the new SEND Code of Practice says we should have while everyone is playing catch-up. I feel that the system as it looks right now, will be a little different in a few years, when the SEN lawyers have knocked the edges off it and pressure put on the next government (whoever that shall be) has improved the parts that are inadequate at present. For example you can only, so far, appeal the education part at Tribunal and there is no single point of appeal - this may well change at some point (we hope). This is why us parents in the system right now must be informed and vigilant and why the Parent Carer Forums out there must concentrate on reaching EVERY parent, not just the ones who make themselves heard. Some PCFs have been overwhelmed by the demands of the SEN reforms or trying to build links with their local authority and health services that - especially in large LAs - meeting parents locally may have become even more difficult, time-wise. Especially because they are, by definition, parents themselves. And as Debs, Ange and I well know from our time as PCF co-chairs, attracting new, energetic, forward-thinking, hands-on parents who have time to spare ain't easy. Bums on seats are not enough when there is so much work to be done. We at SNJ want to support the country's hard-working Parent Carer Forums. If you're in one, get in touch. This is also where Parent Partnership Services (Information, Advice & Support Service) have a key role to play in disseminating information to parents about the reforms, so that parents know that they are supposed to be at the heart of this new process, whatever they are told. Before we get to the Flow Chart, I need to say this: If you need qualified legal advice, seek free help from IPSEA or Contact A Family’s SEN service. There are others too who offer free advice. There are also SEN advocates available who cost less than fully-fledged lawyers, but of course, if you feel that you need to spend thousands of pounds on legal help *, there are quite a number of skilled specialist SEN lawyers around. 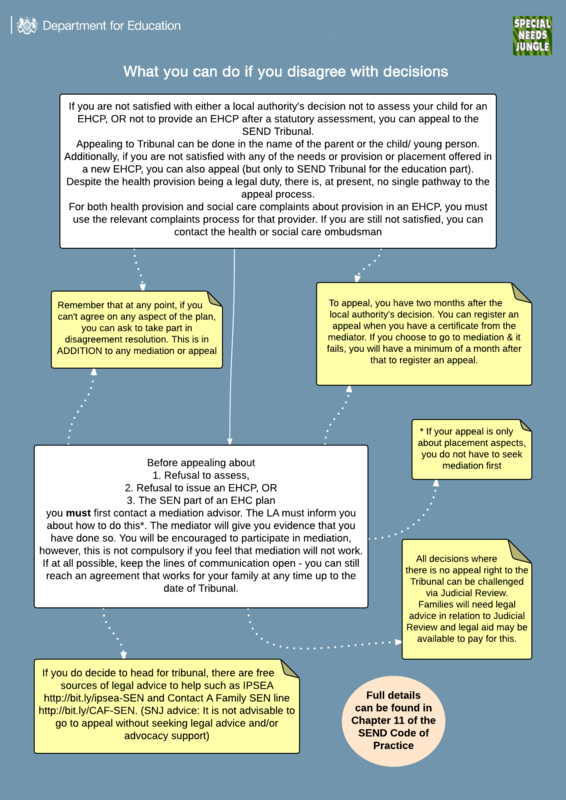 This chart is based entirely on what is in the new SEND Code of Practice because we are not, unlike the above, qualified to give legal advice. However, we assume you want to know what it says in the CoP, so take a look, please do share with others and if you find any of the images or PDFs of the flow charts do not meet your needs for printing out in large size (you are welcome to do this, just don't charge anyone for it above your costs- that wouldn't be nice.) please get in touch. I can email you a high resolution version of any or all of the flow charts for no charge. REMEMBER: Before appealing, you MUST seek mediation (though you don't need to take it) and you should try to keep your communications civil and open. If the LA don't reciprocate, make a note of this in case you need to produce evidence at Tribunal. Keep notes of every communication, but always do your best to reach an acceptable agreement spending as little of your own money as possible! Brilliant flow charts Tania, will really help parents get the best support for their child – lets hope the new CoP works! Hi nice and clear but you haven’t included a vital resource available to parents and young people which is the free and impartial SEND Information & Advice Services who are replacing/enhancing Parent Partnership Services and really should be the 1st point of contact and all the way through. All PPS are building on their current legal training and finishes ne legal training (Accredited with 30 hours of Solicitor’s Regulation Authority (SRA) CPD hours. They will also have detailed knowledge of local policy and procedures and can signpost to other services.